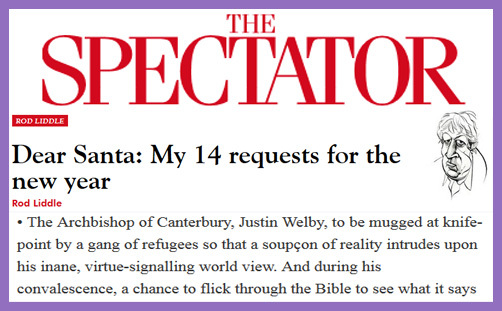 The Archbishop of Canterbury, Justin Welby, to be mugged at knife-point by a gang of refugees so that a soupçon of reality intrudes upon his inane, virtue-signalling world view. And during his convalescence, a chance to flick through the Bible to see what it says about marriage, fidelity, hard work, discipline — and, indeed, other religions. A joke, you might insist; a little festive levity to amuse and divert attention from the perpetual Brexit morass into which we are sinking. Possibly. But when you read Rod Liddle’s justification for his wish, it reads rather like an impassioned plea; sincere contempt for an archbishop who needs to be taught a short, sharp lesson about the real-world effects of immigration and subjected to some robust religious instruction on the virtues of puritanical biblical fundamentalism. Would the Spectator have published a ‘joke’ about Lambeth Palace being bombed by Islamists so that a soupçon of reality might intrude upon the Church of England’s inane, virtue-signalling support for moral relativism or multiculturalism? Would they have published Liddle’s wish if the word ‘mugged’ and been replaced by ‘knifed’? Would they have published this wish if the target had been the Bishop of London, and Liddle’s hope had been that she might be raped at knife-point by a gang of refugees? Why is ‘mugged’ an expressible hope, but ‘knifed’ or ‘raped’ beyond the pale? Or would they not be? Perhaps the editor, Fraser Nelson, might enlighten us? And if a stranger sojourn with thee in your land, ye shall not vex him. But the stranger that dwelleth with you shall be unto you as one born among you, and thou shalt love him as thyself (Lev19:33f). He doth execute the judgment of the fatherless and widow, and loveth the stranger, in giving him food and raiment (Deut 18:18). Pure religion and undefiled before God and the Father is this, To visit the fatherless and widows in their affliction (Js 1:27). And oppress not the widow, nor the fatherless, the stranger, nor the poor (Zech 7:10). Thou shalt neither vex a stranger, nor oppress him: for ye were strangers in the land of Egypt (Ex 22:21). There is, of course, more; much, much more: the Lord is Father of the fatherless and protector of widows. Our task is to feed them, clothe them, and ensure justice for them. But Liddle appears to have a problem with what the Bible says about loving one’s neighbour or having compassion for those in need – genuine need. He could have targeted all manner of foreign freeloaders or bogus asylum seekers (on whose behalf the Archbishop of Canterbury has never ‘virtue-signalled’), but instead he chose the widow fleeing Nigeria who watched her children being sliced by a machete while her husband was burned alive in the local church. He chose the orphaned children fleeing Syria having been forced to eat rats to survive after their parents were gassed by forces unknown. Refugees are not to be ‘virtue-signalled’ over; they are to be fed, housed, counselled, cared for and loved. We live with the expectation, with the hope, of life transformed. We live in a world where hospitality to the stranger, peace without violence and even hope of life everlasting is promised within the terms of our faith – and of other of the great world faiths. …I have, before holding this role, visited a colleague, now a bishop, in the Eastern DRC, during a period of heavy fighting, when, like the boy who stood on the burning deck, whence all but he had fled, most NGOs had gone. But this clergyman stayed on and I was working with him and learning from him as he went out to bring refugees through the battle lines to safety. Before, during and after conflict. So, in this season of peace on earth and good will toward men, we might reflect on the fact that Justin Welby, for all his faults, is a man who contends for love, peace, hope and reconciliation; for friendly cooperation and mutual benefit. He fulfills that which was spoken by the Lord and revealed by his prophets. The Spectator, by contrast, for all its virtues, believes in and propagates a different ethic; a bitter prejudice; a distinctly anti-Anglican sentiment which seeks to stir up dissent and provoke animosity and hostility toward the the leader of the Church of England and the symbolic head of the worldwide Anglican Communion. ‘If the world hate you, ye know that it hated me before it hated you‘ (Jn 15:18). The world is divided into those who belong to God and those who do not. Justin Welby belongs to God; the Spectator is from below. Merry Christmas, Rod Liddle. Try to find some time over the festive season to hear the word of God and to obey, in order that you might find eternal life and come to understand the true meaning of Christmas.